The Rhine River is one of the most beautiful waterways in the world. 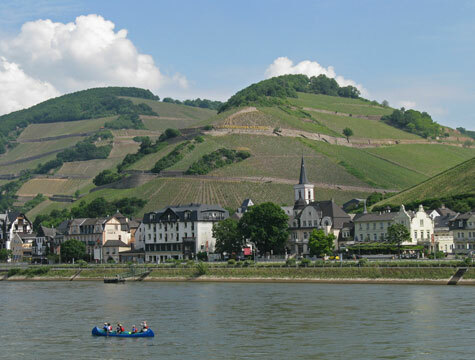 Interesting tourist attractions and pretty towns can be found throughout the Rhine Valley. Towns of particular interest include Bingen, Bacharach, Oberwesel and St. Goar. If you like to shop, Mainz is the place to visit. The Reichenstein Castle, Rheinfels Castle and Loreley Rock are three popular tourist attractions in the Rhine Valley. Many visitors enjoy taking a Rhine river cruise. This is a great way to relax and enjoy all the sights. The Rhine Valley is centrally located in Europe. It is easily reached by air, train or automobile. Many visitors fly to the Frankfurt Airport and then catch a regional train (S-Bahn) to Mainz. The trip takes less than one hour. Excellent hotels, restaurants and cafes can be found in the Rhine Valley.